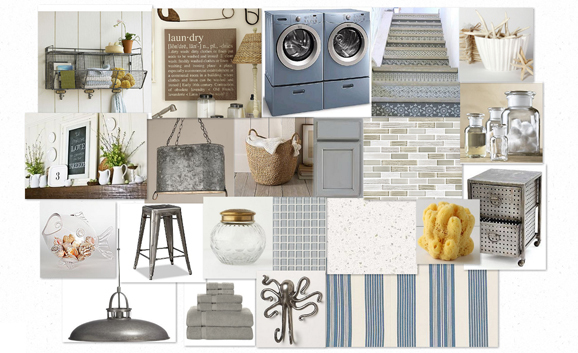 Today I decided to create a laundry room that I would actually want to spend some time in. Doing the laundry is a long and tedious process, so you might as well have a great space to make the task a little more enjoyable. The piece that started this whole design is the Galvanized Metal Wash Tub Lantern. I collected this piece a while ago on Olioboard and have been dying to create a space with it ever since. It’s weird and bulky but strangely attractive. The industrial style storage unit, chicken wire shelving, and stool work really well with this light fixture and the cool, blue-grey colour scheme. I found the fantastic tile staircase on olioboard and had to add it to this design. I love all the different patterns and how they turn your stairs into a work of art. The colour and tones in the backsplash tile are picked up in the countertop and cupboard door. This ended up being a great colour scheme to work with since Frigidaire washer and dryer sets from Affinity are now available in Glacier Blue and Platinum Ice colors, tying in perfectly to this design. I completed the space with fun and functional artwork (blackboards are great for making quick notes), sea inspired accents and decorative glass jars to store the essentials.